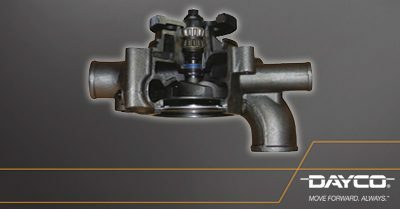 February 4, 2019 – Dayco, a leading engine products and drive systems supplier for the automotive, industrial and aftermarket industries, announced today the launch of a new heavy duty water pump product line. This will expand their current North America water pump product line to initially provide 55 SKUS, covering 97 percent of heavy duty applications. Dayco heavy duty water pumps are engineered to OE standards with cast iron blades and have been 100% end-of-line leak tested. Designed with the latest technology, the heavy duty water pumps feature upgraded materials for the bearing, impeller and gasket. Low friction seals: prevents coolant leakage and provides a longer service life. Cast iron blades: ensures efficient coolant flow, provides higher performance, improved efficiency and reduced cavitation. Coolant-resistant bearings: optimized for each individual application and capable of withstanding high rotation speeds and heavy loads. “We are excited to expand our current product line in North America and launch heavy duty water pumps. This will offer our customers another great solution to enhance our current line. Dayco will continue to move forward, offering innovative and valuable options for our customers.” said John Kinnick, executive vice president US aftermarket. The heavy duty expansion of Dayco’s current product line showcases a high-caliber component that carries the same assurance of quality found in all Dayco branded products.